Jawa 300 Classic Roadster spotted in clear images! 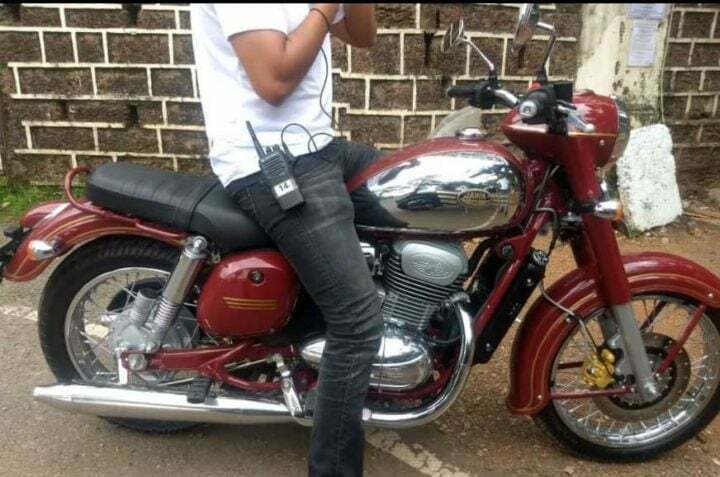 Jawa 300 Classic Roadster has been spotted without any camouflage for the first time! 4 Jawa motorcycles are going to be unveiled on 15th November. Looking at the clear images, we say that it is truly a ‘Nostalgia with an update’. Here are the first images of the upcoming Jawa 300 Classic Roadster! It was spied during one of its promotional shoots. Mahindra and Classic Legends have done an excellent job of making it look as near to the original one. They have checked all the design points – Chrome highlights, dual exhaust, the Maroon colour and the bulbous fuel tank. As per the latest teaser, 4 Jawa motorcycles will be launched on 15th November. The bikes include a Classic Roadster, a Bobber, a Scrambler and a Cafe Racer. The spied Jawa 300 Classic Roadster looks a lot like the Jawa 250, which was the first one to come to India. On the front, it gets the identical headlamp cowl with the covering and speedometer resting on top of it. It comes with conventional telescopic forks in the front and the exact front fender design. Although, now it sports a disc brake with the original spoke wheels. Also, the oval chrome dipped blinkers complete the front original look. Also Read: 4 Jawa Motorcycles to launch on 15th November! The chrome dipped beefy fuel tank is the same as the ‘Jawa’ logo. The engines have changed, but the layout remains quite identical. It gets a 300cc engine with dual exhaust chrome canisters. Even the exhaust is the same. You may spot a storage space with a keyhole on it. It may be used to house the battery. At the rear end, it gets spoke wheels but without a disc brake. Being a roadster, it gets a single flat seat with a small tail grip at the end. Lastly, the rear tail lights and the oval indicators complete the exact retro look. Also Read: Royal Enfield 650 Twins launching on 14th November! Summing, up Jawa 300 Classic Roadster looks like no new bike. Just some its and bits like disc brakes are added on the original bike. It looks very different from the Mahindra Mojo 300, with which it was rumoured to share the platform and engine. The Jawa 300 comes with a 293cc liquid cooled engine that puts out 27 BHP and 28 Nm of peak torque. The engine pairs up with a 6-speed gearbox. The engine will most likely be ready for BS-6 norms. Also, Classic Legend claims to bring a very identical exhaust note like the old Jawa in this iteration. We expect the prices to start off at Rs 1.3 Lakhs onwards. For the old memories, it might just come with only 1 colour option. As earlier, it will compete with the likes of Royal Enfield Classic 350.